Looking at the media reactions to date, seems to be Brown = robotic Neanderthal spin-monster, Cameron = Bloke next door. If you live in Surrey. Brown, with an inside track on the true nature of the UK economy, may well have already concluded that this is as good as it gets. If he does ask the Sovereign for an election next Tuesday, get ready for a rough financial ride. The full analysis from The Institute of Public Policy Research, a left-leaning research organisation, that forms the basis for tonight's 'Dispatches' on C4 is a welcome one, and worth reading in full. The research looks primarily at the demands or contributions made by those born overseas to the UK's economic and social fabric, but also looks at how these characteristics endure through to second and third generation immigrants. Pakistanis, Bangladeshis, Somalis, Turks and Iranians score consistently poorly - making the highest demands on welfare benefits, welfare housing and welfare services, and making the lowest economic contributions to our society. Whilst the children of Iranians tend do well from education, those of the other groups do not, thus locking in whole generations from these ethnic groups in welfare dependency. Two further characteristics of these populations are not explored in the IPPR report; the tendency of these ethnic groups to live in their own communities and to resist integration, and the prevalence of a primitive form of Islam in those communities. Indeed, it hardly needs pointing out that both the 7/7 bombers and the 21/7 bombers were drawn from these ethnic groups. A recent study by University College London has found an alarming infestation of bedbugs concentrated in East London; a spokesman on Radio 4's 'Today' narrowed the probable route of transmission to passengers on the tube line between Aldgate East and Stratford. This part of London also has an alarming incidence of multi-drug resistant TB, and a markedly lower life expectancy than areas of London just a few miles away to the West. This part of East London is also home to high concentrations of those ethnic groups that score most poorly in the IPPR study. When William Beveridge set out the foundations of the welfare system, he declared war on the 'giant evils' of Want, Disease, Ignorance, Squalor and Idleness. All these evils are alive and well in our most problematic ethnic communities. Overcrowding, poor hygiene, educational failure, unemployability, poverty and extremism amongst such significant parts of our population should not be tolerated in the twenty-first century. That such conditions have not merely been tolerated, but encouraged by a naive and imbecilic policy of 'multiculturalism' that has allowed these problems to fester unchecked, a loss of control of our borders under Labour, and encouraged by an obtuse and rash system of State Welfarism, does us no credit as a nation. Thank you, Norman. Quite Right. I really warmed to Norman Tebbit when he spoke at the memorial service for Lord Harris at St John's in Smith Square. Ralph Harris, of course, was deeply committed to smokers' rights group FOREST. Tebbit, a lifelong non-smoker, offered to light-up on stage, and drew a massive round of applause. EU Constitution referendum - whether the socialists have already signed up or not. There is no treaty in the world that can bind a future Parliament. Governments are overturned by electors voting for change — not a different coloured status quo. Inept opposition has let Gordon Brown claim ownership of the Tory ground of economic competence and patriotism. There is no time to win it back before an October election, so Cameron must find popular causes which Labour cannot claim as their own. Policy on education and health is not sufficiently different. Immigration and multiculturalism is. Even the Commission for Racial Equality now sees the value of the cricket test. Cameron has pledged repeal of the Human Rights Act. Now he needs to challenge the power of Brussels to overrule Parliament’s laws. And Cameron’s promise of a EU referendum will split Labour. Even better is English votes for English laws. 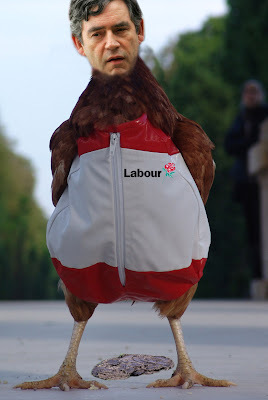 Brown cannot risk Labour’s Scottish votes by adopting that, which would leave Labour’s candidates in England to argue what is good sauce for the Scottish goose is too good for the English gander. And that's an EU Referendum, Secure Borders and an English Parliament ticked off. Just Localism and Party Reform to go. Watch this space.